It never occurred to her. She grew up a few miles from the corner of Ash and Main, but like every other kid in Massachusetts she knew it as a day off from school. It’s called Patriot’s Day and it celebrates the Battle of Lexington and Concord. There’s a Red Sox game that day too, and yeah, there’s a race in the next town over. It never occurred to her that someday she’d be toeing that iconic, blue, start line in Hopkinton. Sarah DiStefano grew up in Southborough, MA, and played soccer and basketball. She was the oldest of three and by the time she entered high school she began to take basketball very seriously. It was also the time that she started to run. Sarah joined her high school track team and rather than running sprints or short distance races, she turned to cross country. And that began the journey that Sarah is on today. After college she continued to run. And like so many others she found long distance running a way to think, to burn some stress and to stay in shape. She ran her first half marathon in 2012 and it was after those 13.1 miles that she decided she wanted to run that race in the next town over. The race we know as simply, Boston. For Sarah, running marathons is about the good she can do for others. It’s about running for a cause and about supporting those less fortunate. 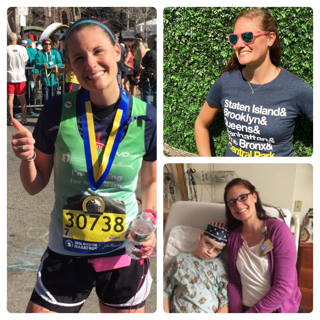 It’s about the inspiration she feels from the patients and their families she meets, and it’s about the strength she sees in her fellow runners. This is what drives her and it’s why Sarah loves being a charity runner. Sarah’s first marathon as a charity runner was Boston in 2016. She ran from Hopkinton to Copley Square with the team from the New England Center for Children (NECC), an organization that is dedicated to transforming the lives of children with autism. Next up was the 2017 Chicago Marathon and she ran it for The Danny Did Foundation, whose mission is to prevent sudden deaths caused by seizure. The foundation celebrates and serves the memory of little, four-year-old Danny Stanton, who died suddenly in 2009. And last Sunday, November 4, 2018, Sarah ran the NYC Marathon with the Boston Children’s Hospital team in support of their Miles for Miracles Campaign a campaign of new treatments, new tools and new ways of healing, designed to transform the lives of kids and their families around the globe. One of Webster’s definitions for the word inspiration is; ‘the action or power of moving the intellect or emotion’. For Sarah there are two people who have clearly defined this word for her. Two people who have left an indelible impression on her and two people who will live in her heart forever. His name is Reilly. Sarah met him 3 years ago, while working at Boston Children’s Hospital in 2015. Reilly suffers from a very rare, genetic mutation (KCT07) that causes an epilepsy disorder. It’s a regressive disease but the resiliency of little Reilly and his parents are a constant inspiration to her. Every day and every time they see each other, it reminds Sarah of the strength of the human spirit. Jill was Sarah’s older cousin and her running mentor. In many ways, Sarah began running marathons seriously because of Jill. She who would send her training tips, provide Sarah with unwavering support and was always close by with words of encouragement and praise. But in 2017, a few weeks after Jill had completed the NYC Marathon, she was fatally struck by a car on an early morning training run. Last Sunday, Sarah ran the NYC Marathon in Jill’s honor. Sarah has a bachelors degree in Health Management and Policy, and a master degree in Healthcare. Today, she works as an Operations Supervisor at Brigham and Women’s Hospital in Boston. She’s passionate about the work she’s doing around the patient experience, the new initiatives in the healthcare field and about enhancing every patient’s time spent in the hospital. She coaches girls youth basketball in Waltham, MA and someday hopes to complete the six world major marathons; Chicago, Boston and NYC, three down, three to go! 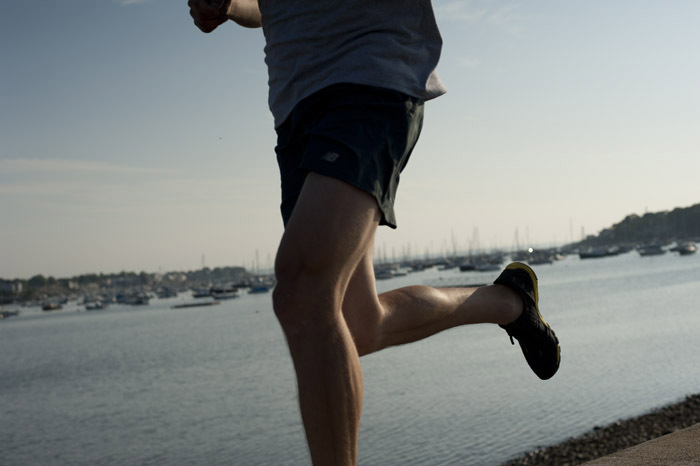 Training for and running a marathon requires a great deal of resilience. It’s long hours on the road. Sometimes in the dark and sometimes in brutal weather. And people say long distance running is as much about someone’s heart as it is about their physical conditioning. Sarah Di Stefano’s heart runs long. Long past the 26.2 miles. Long past the time she leaves the office. Always for those fighting a personal battle. And always for Reilly and for Jill. There’s still time to donate to Sarah’s fundraising to the Miles For Miracles Campaign. For every Chicago, Boston or NYC Marathon item that we sell, we will donate $5 to Sarah’s fundraising efforts. Visitwww.democracyofsweat.com and use code SARAH when ordering.